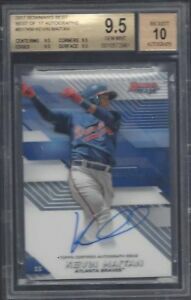 2017 Bowman's Best Kevin Maitan AUTO Prospect RC, Braves - Angels! 2016 Bowman Chrome RICARDO SANCHEZ Autograph BGS POP 2!!! BGS 9.5/10 GEM MINT! !